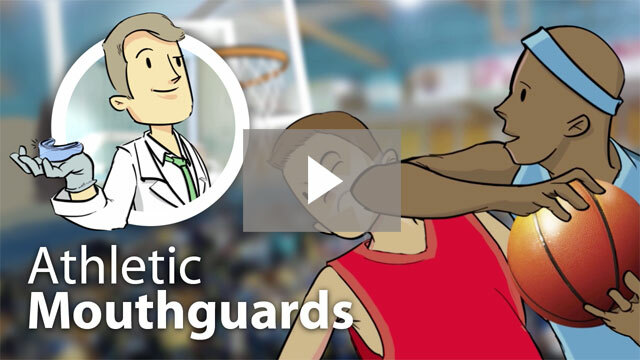 Why should you use a mouth guard? Sports should be enjoyed, you should not have to worry about a losing your teeth! But unfortunately, tooth loss and jaw fractures are the most common sports injuries. These can be very painful and cause a lot of distress. Therefore, it is very important to wear a mouth guard when playing sports to avoid all of these. Research tells us failing to wear a mouth guard increases your chance of injury while playing sports by 60 times. Scary right? Think about that next time you decide to play a sport without the use of a mouth guard. smile you deserve. We’re here to help! range of expertise. Learn more about us! A custom-made mouth guard offers better quality as well as fit, leading to better protection. They allow you to speak clearer and do not cause damage over time to your mouth that generic ones can. You should keep in mind that mouth guards wear and can perforate overtime, providing less protection. They should be replaced after each season, especially when it comes to adolescents since their mouth structure is continually undergoing growth. Although some sports may not highly require the use as a mouth guard, like for example boxing does, it is important to at least wear a thinner one. The minimal mouth guard thickness should be around 1.5 mm. For contact sports, like martial arts, the minimal thickness should be at least 4 mm, and for non-contact sports, like tennis, a 2 mm should be ideal. Make sure to keep yourself safe and free of dangerous injuries, wear a mouth guard and help avoid any maxillofacial trauma. Mouth guards are a painless way to stay protected and keep a nice smile. Dr. Tyler and his team can make the right one for you and the sport you play, just ask! For any further questions about athletic mouth guards do not hesitate to ask us. Contact us today to schedule an appointment or to learn more about how Stuart Prosthetic Dentistry can help you achieve the smile you deserve. To provide EXCELLENT DENTAL CARE enabling each patient to maintain their teeth for a lifetime in maximal health, aesthetics, and function. In harmony with patient’s expectations, focusing on individual dental concerns, dedicated to the HIGHEST STANDARDS of care in the restoration and replacement of teeth. What's the Difference Between Dental Implants and Bridges? Why Should I Consider Veneers?